In 2013 Louise reviewed For the Good of Mankind by Vicki Oransky Wittenstein. 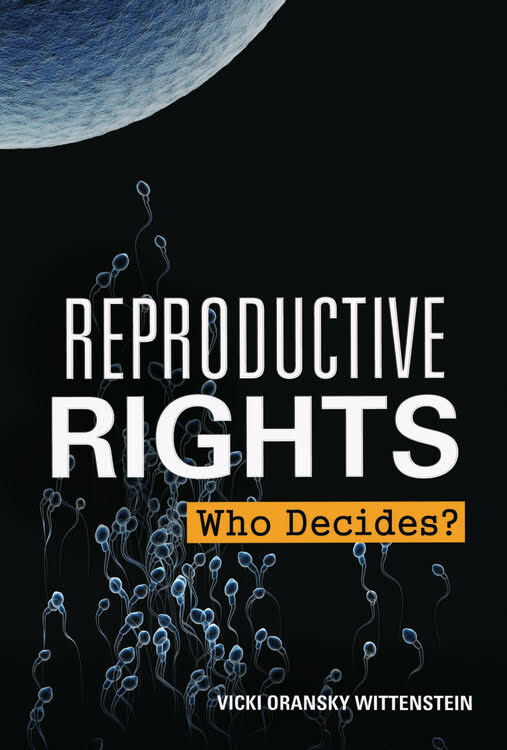 Today I am pleased to review Vicki's latest nonfiction book for teens, Reproductive Rights: Who Decides? If you have viewed any of the recent Republican or Democratic debates, you have seen the topic of reproductive rights passionately discussed by candidates. However, many teens (and adults) may not be aware of the long and controversial history of reproductive rights in our country and around the world. Vicki Oransky Wittenstein sheds light on this important topic as she weaves together a history of religious views, social opinions, medical advances, courts cases and government laws related to reproductive rights. The book is organized chronologically beginning with the use of contraceptives in Ancient Egypt and Persia. Following chapters describe how religious beliefs (Roman Catholic and Puritan) and societal views of women influenced women's health and reproduction. Women in the U.S. in the 1800s didn't have the right to vote, and they also were limited in their choices when it came to reproduction. Women who wished to use birth control for family planning were limited due to the lack of information on the topic, resistance from doctors, and restrictions placed on birth control by churches. Anti-obsentity laws were passed in the late 1800s making literature published about birth control practices illegal and punishable by jail. One chapter of the book describes the work of activist Margaret Sanger at the turn of the century and is followed by a chapter on how the birth control pill changed women's lives once it was approved by the FDA in 1957. It is evident that Wittenstein spend a great deal of time researching the history of birth control and reproductive issues. The information is presented in a clear and concise manner without the author inserting her personal opinion. The book effectively explores several societal and medical issues such as wealthy vs. poor women and their access to birth control and healthcare. Black and white photographs and sidebars help readers comprehend the complex topic. A lengthy bibliography, source notes, a timeline and lists of print and digital resources are located in the back of the book. Reproductive Rights: Who Decides? is highly recommended for high school libraries and for teen collections in public libraries. The book will be an informative read for teens interested in women's health, individual rights, medical history and laws, and it could be studied in history or health classes or used by students when writing argumentative essays or debating the topic of reproductive rights and the rights of individuals. Be sure to visit the other blogs on the blog tour.